Note: Governor of Dumbarton Castle; a Lord of the Scottish Treasury 1705-06; a Commissioner of the Treaty of Union with Scotland; a Representative Peer for Scotland 1707-13 and 1715-61; an Extraordinary Lord of Session 1708-61; Lord Justice General of Scotland 1710-61; Lord Clerk Register 1714-16; Lord Lieutenant of Midlothian 1715-61 and Haddington 1737-61; Lord Privy Seal for Scotland 1721-33; Keeper of the Great Seal of Scotland 1733-61; on his death the 1706 peerages became extinct. Quarterly: 1st and 4th, Gyronny of eight Or and Sable (Campbell); 2nd and 3rd, Argent a Lymphad Sable sails furled flag and pennants flying and oars in action proper (the Lordship of Lorne); in saltire behind the shield a Baton Gules powdered with Thistles Or ensigned with an Imperial Crown proper thereon the Crest of Scotland (as Hereditary Great Master of the Household in Scotland) and a Sword proper hilted and pommelled Or (as Hereditary Lord Justice General of Scotland). 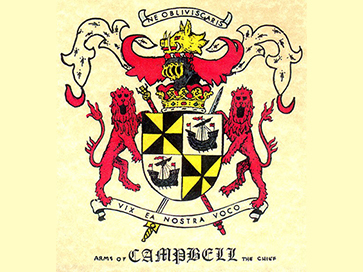 "Vix ea nostra voco" The words are Latin and associated with the Campbell name as well as many other clans and families. The phrase means "I scarcely call these things our own". The motto relates to the principle of stewardship, that we don't really own anything, we just look after what we have throughout our lifetime.